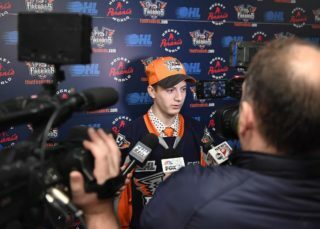 Flint, Mich. – The Flint Firebirds played a physical brand of hockey in a 6-3 defeat to the Kitchener Rangers Saturday evening at the Dort Federal Event Center. The two clubs combined for a total of 36 penalty minutes in the contest, 78 shots on net, and nine goals. Kitchener native Eric Uba scored his third career goal in as many games, earning ‘third-star of the game’ honors for his efforts. C.J. Clarke and Connor Roberts each scored their first of the season, and netminder Luke Cavallin made 41 saves in a stellar performance between-the-pipes. With a late surge that produced three goals in under five minutes late in the game, the Rangers skated away with the victory. Jacob Winterton created the first scoring opportunity for Flint just one minute into the contest, when he poked the puck free of a Rangers’ defender at Flint’s offensive blue line. He was the first into the zone on puck pursuit along the right wall as teammate C.J. Clarke crossed into the zone along the left-wing boards, essentially creating a two-on-none opportunity with defenders closing in quickly. Winterton quickly gathered the puck in the right corner and stick-handled toward the crease. Before the defense could disrupt the play, Winterton sent a pass across the top of the goal crease where Clarke was wound up and ready to unleash. He beat Kitchener netminder Lucas Pfeil, back door, for his first of the season at 1:05. With the assist, Winterton tied his captain Ty Dellandrea (Dallas Stars) for the team lead in points, each now with five. The balance of the opening frame was a penalty-filled affair, with four two-minute minors called on Flint and two minors called to the Rangers. Kitchener had three power-play opportunities that the ‘Birds were able to successfully kill, including a four-on-three and five-on-three Ranger man-advantage. After 20 minutes of play, Flint had outshot the visitors 12-7 and led the game 1-0. The second period started much like the first, with Flint scoring just over one-minute in. The defensive pair of Fedor Gordeev (Toronto Maple Leafs) and Hakon Nilsen passed back and forth briefly deep in their own end to create space for the forwards. It was Gordeev who opted to keep the puck and carry it deep behind the Kitchener cage. From there he made a short centering pass that found Roberts for the one-timer. It was Roberts’ first of the season, scored at 1:02. Kitchener cut their deficit in half during four-on-four play, with a skater from each side in the penalty box. On a neutral-zone turnover, the Rangers created a three-on-two rush into the ‘Birds’ zone. Justin MacPherson made a centering pass to Rickard Hugg between the tops of the circles. Hugg quickly advanced the puck to the right-wing side for Greg Meireles, who one-timed it past netminder Luke Cavallin for his fourth of the season at 3:17 of the middle frame. Donovan Sebrango netted the equalizer at 8:57 on a high, hard slapper from the right point. The puck traveled between three bodies in the slot and deflected off the left post and in for his first of the campaign, assisted by his centerman Eric Guest. The go-ahead goal came off the stick of Nick McHugh exactly three minutes later. Hugg faked a shot from the right-wing point and instead sent a heated pass to Meireles below the goal line to Cavallin’s left. After a failed attempt to wrap it in near side, Meireles sent the puck out to Nick McHugh inside the slot. McHugh skated in toward the goal as he sent a wrister past Cavallin for his second of the season. Kitchener outshot the Firebirds 24-11 in the second period for a two-period advantage of 31-24. Flint trailed by one on the scoreboard. Eric Uba tied things at three with his third goal of the season at 11:38 of the final frame. After an incredible tape-to-tape outlet pass from Keppen, Uba showed a great individual effort, stepping around a defender in front of the Kitchener bench and gaining the zone. From there he was able to skate toward Pfeil unabated. He fired a wrister that found twine far-side, extending his scoring-streak to three games. Ethan Keppen and Marcus Gretz picked up the assists. The Rangers answered with a trio of quick goals late in the game to claim the victory. Riley Damiani (Dallas Stars) picked up his fourth of the season, assisted by McHugh at 12:18. Yantsis tallied his second of the night and sixth of the campaign at 16:08, assisted by Guest and Damiani. Then Damiani collected his second of the night and fifth of the year at 17:03, assisted by Hugg and Gareffa. The game concluded in favor of the visitors 6-3. Third-period shots were 16-7, advantage Kitchener. 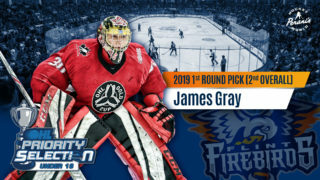 Next up for Flint, the Firebirds will head to Saginaw for a Saturday night match-up against in-state rival, Saginaw Spirit. Puck drop is set for 7:05 p.m. at the Dow Event Center. The game can be heard live on the radio throughout Flint & Mid-Michigan on US 103.1 FM and online at www.us103.com. Pre-game coverage with Dominic Hennig will begin at 6:30 p.m. 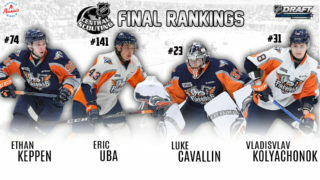 The game will be televised live province-wide across Ontario on the OHL Action Pak on channel 445 for both Rogers TV & Cogeco TV cable subscribers. Next Home Game: The Firebirds will return home to the Dort Federal Event Center next Sunday, Oct. 21 for the first ‘Family Sunday “FUN”day’ of the season at 2 p.m. (ET). Every Sunday Firebirds home game will be a Family Sunday “FUN”day featuring up to 2 free kids tickets with the purchase of an adult ticket as well as a post-game ‘skate with Firebirds players,’ and an autograph signing session with Firebirds players.